My Tampa Bay Mommy : It's 7/11 - FREE Slurpees at 7-Eleven from 11-7! 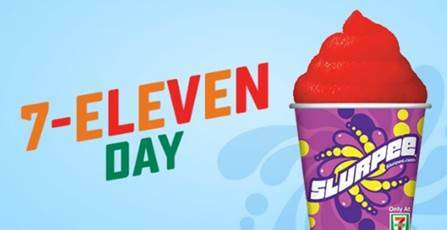 It's 7/11 - FREE Slurpees at 7-Eleven from 11-7! Head to your closest 7-Eleven on 7/11 from 11-7 and score a FREE Small Slurpee. This is one of my favorite freebies of the year. Try their new flavor too to celebrate their 90th birthday, Cotton Candy. Slurpee fans can celebrate all week from July 12-18th with Slurpee Week. Simply purchase seven total Slurpee drinks throughout the week through the 7-Eleven mobile app and you will get 11 Slurpee drinks FREE!!! Score for the summer!